A National Audubon Society project has restored these seabirds to islands off Maine. But could this good work be undone? An Atlantic puffin returns to a numbered burrow on Maine’s Eastern Egg Rock, a research site for Project Puffin. I MADE MY FIRST VISIT to a seabird colony in the 1960s and found it dazzling from the first moment ashore. We were attacked by a swarm of Arctic terns that nested near the shoreline and along the walkway to the buildings on Machias Seal Island on the Maine-New Brunswick border. Razorbills and puffins were more demure, perching atop the bird blinds, buildings, and high rocks. My eyes could not have been wider when the lighthouse keeper pulled out adult puffins and chicks from their rocky burrows. 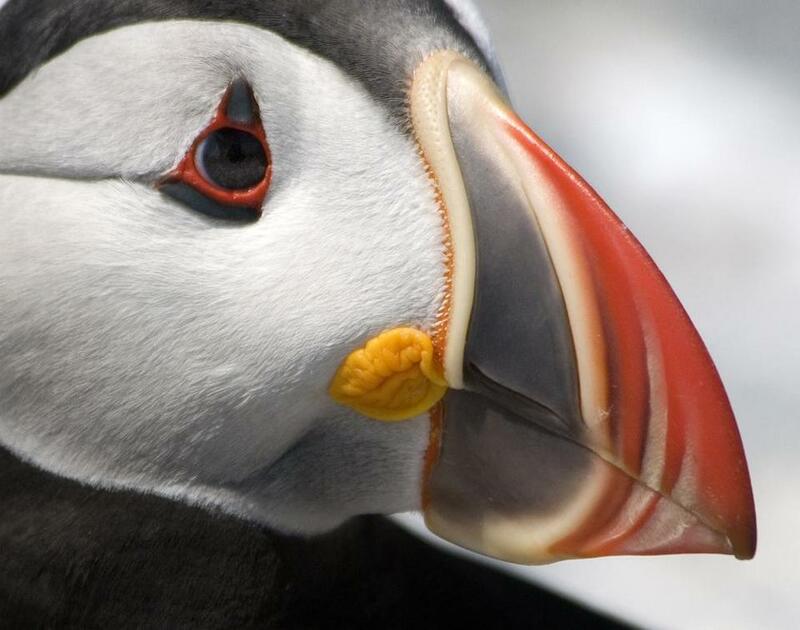 The Atlantic puffin’s black-and-white plumage, which mimics a friar’s robes, prompted 18th-century zoologists to name it Fratercula arctica, “little brother of the north.” Thanks to its brilliant, clownish red-orange-and-yellow bill, the puffin was once known as the sea parrot. 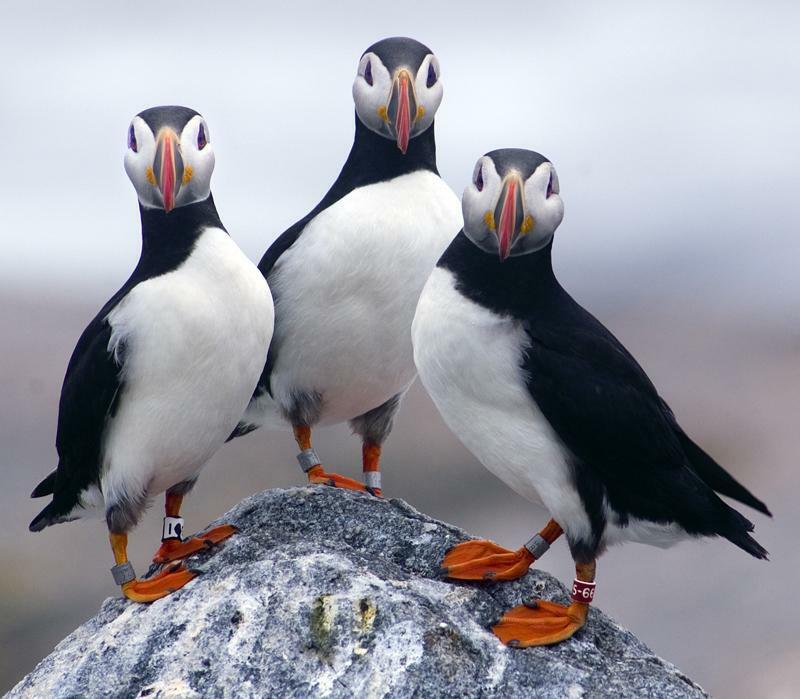 Many today consider the puffin to be the most endearing bird of the North Atlantic. Although never listed as endangered, Atlantic puffins were plundered in Maine and Canada in the 19th century for food and feathers. The National Audubon Society and I started Project Puffin in 1973 with the knowledge that no seabird has ever been restored to an island where humans had wiped it out. On a shoestring budget and against daunting odds, Project Puffin offers proof that individuals can make a difference and that enterprising conservation programs at local levels can have larger benefits to species conservation. Today, more than a thousand puffin pairs are nesting on several Maine islands, and this development has led to a flourishing industry called puffin watching. It is ironic that at the same islands where shooters once used 8-foot-long punt guns to blast seabirds 50 at a time, now the sight of even a single puffin is greeted by cries of delight from boats carrying a hundred or more bird-watchers. This change in value is one of the more hopeful signs of our time. The great biologist E.O. Wilson said, “A wilderness of sorts can be reborn in the wasteland.” We hope one place of rebirth is on 7 acres of jumbled rock 6 miles off the coast of Pemaquid Point, Maine. I USED THE SUMMER OF 1972, while an ornithology instructor at Hog Island Camp in Bremen, Maine, to gain some experience rearing black guillemots, with encouragement that I might see the first puffin chicks the following summer. I thought that guillemots would help me develop puffin chick-rearing methods because they are in the same family (Alcidae) and have a similar life history. Both species are rock crevice nesters that eat fish as chicks and have a fledging strategy where the chick leaves the island solo. Permits in hand, I collected six guillemot chicks from nearby Franklin Island. I started out rearing them in cardboard boxes lined with newspaper on the porch of the Binnacle, an early 1900s Hog Island cottage that I shared with other camp instructors. When the first guillemot reached fledging age and sported its full set of juvenile feathers, I released it into the ocean, but as it swam away, it sank lower and lower, until only its head was above water. Something was dreadfully wrong. The sad little bird lacked waterproofing. I tried to retrieve it, but it had paddled off into deep water, and the fog soon engulfed it. Watching my first fledgling sink into the Atlantic was a tragic and humbling moment. I returned to Franklin Island and marveled at the excellent condition of wild-reared guillemot chicks. I saw, with envy, how the birds had immaculate plumages when reared by parent guillemots in simple rock cracks. From this, I learned an important rule about chick rearing: Keep it simple and try to replicate the natural conditions. It was 1973, and I was on the verge of launching Project Puffin with Kathy Blanchard as my first research assistant. Although we had several surviving guillemot chicks, their ups and downs hardly represented a gold standard of nurturing. We wondered if anything we were learning was worthwhile for the high-stakes challenge to come. We flew to Great Island, Newfoundland, to collect six puffin chicks. I kept the chicks by my side on the plane back to Maine on July 15. At last, Project Puffin was really beginning. I carried the chicks on the final leg of their journey to the cottage, and the next morning we moved the chicks to their new homes. We placed three in separate rock burrows and covered the entrances with wire mesh. The remaining three were placed in plywood chick-rearing boxes on the porch. We had smelt on hand to feed them. The day after the transplant, one of our three puffins from the rock burrows was missing. At first we suspected our own shoddy handiwork. We discovered a crack in the burrow large enough for the chick to escape. We immediately applied cement to the crack and checked every nearby crevice to find the chick. Alas, we found nothing. Sober with regret over losing one of our precious puffin chicks, we decided to entomb the remaining two chicks in their burrows by cementing hardware cloth over the burrow entrances, leaving just a tiny opening through which we could slip in the smelt. We replaced the lost puffin with a home-hatched guillemot, hoping to learn if a rock crevice habitat would give it better waterproofing. Then more panic: The guillemot chick also vanished. We were desperate for an answer to this mystery. We suspected rocks caving in due to a careless hiker or more shoddy craftsmanship on our part, but then we noticed a telltale clue — a few raccoon hairs on the hardware-cloth doors. We brought the remaining puffin chicks indoors. Crew members of Project Puffin row from a nearby supply boat to the 7-acre Eastern Egg Rock. On August 16, we began to notice that the puffins in the cottage were becoming restless, fidgeting frantically. Clearly it was fledging time. We needed to move the entire chick-rearing and fledging process to Eastern Egg Rock, a habitat with larger boulders piled in great stacks around its perimeter. It was a natural apartment complex with many layers of burrows under the jumbled boulders. I could imagine the puffins standing against the blue sea, flying in with loads of glistening fish, dropping into dark crevices to feed chicks. In the days before we moved the puffin chicks, Kathy and I had hauled bags of cement and collected rocks to build five release burrows on the southwest shore of Eastern Egg Rock. On August 17, I placed the remaining chicks in a box with separate compartments for each puffling. Joining Kathy and me for the momentous trip were Peggy Morton, her teenage daughter, Leslie, and Karen Thom, the wife of Hog Island instructor Rick Thom. We arrived in late afternoon. I banded each chick with green-coiled plastic on one leg and a metal US Fish and Wildlife Service band on the other. Each was placed in its own rock crevice burrow, and wire doors were secured over the entrances to give the chicks a chance to settle in until dark, when the covers would be removed. We feared that gulls might swoop in and carry off the chicks, so we waited until midnight, when most of the gulls would be asleep, to open the burrow entrances. With the tent camp set up and the pufflings settled into their temporary homes, I returned to Hog Island, where we would wait for news. Preparing to feed its chick, a puffin crams its beak with hake. That night, Kathy, Leslie, and Karen took turns watching the rock burrows, ready to chase off marauding gulls and guarding against high tides. With the burrows open, the chicks were free to explore outside and make their way to the sea when ready. Most of the chicks walked, climbed over the boulders, and eventually scrambled into the surf. One of the pufflings made a more dramatic departure. On August 19, Kathy described in her journal how she watched puffin number three leave its burrow on its way toward the sea. The hardy chick moved slowly, in a straight path toward the water, avoiding most of the cracks and ravines. Sometimes it would tumble out of sight, then scramble back to the surface. Finally, it clambered up a tall rock overlooking the sea, where it stood for about five minutes, as if trying to get the nerve to jump. Several times it leaned forward, followed by a rapid beating of its wings. Then, 25 minutes after leaving its burrow, it flew into the air above the crest of the waves and disappeared into the darkness. Fledging the chicks from Eastern Egg Rock was the high point of the summer, and it set our path and vision of the future. These five birds were our victory — they were the first of nearly 2,000 that would follow a similar path from Newfoundland to Maine. Each was a miracle and offered hope that someday puffins would return to Egg Rock to found a new colony. FOUR YEARS PASSED without a single sighting of a returning puffin. My collaborators with the Canadian Wildlife Service were having doubts about continuing the program, and ongoing funding was unlikely without some sign of success. I worried that these highly social birds might be returning to the vicinity of Egg Rock, but if they did not see other puffins on the island, they might not stay long enough for us to see them. And if they landed on the water but never came ashore, we would not see their bands and be able to prove that the translocations were working. The urgency for success led to our use of decoys, now a hallmark of Project Puffin. I reasoned that if decoys could lure birds into range for hunters, perhaps they could also lure birds to historic nesting grounds. We set out the first of the decoys on June 3, 1977, but extreme weather kept us off the island until June 12. I was returning staff to Egg Rock when I spotted a quick-winged bird flying low over the water near the landing. Soon my curiosity was replaced by disbelief. It was a puffin! I was beside myself with excitement. This first returning puffin landed so close to the boat that I could see its leg bands underwater. More puffins showed us their leg bands in the coming years, but by 1981, none were nesting. Eight years after moving the first puffin chick (12 years after conceiving the idea of the project), I was still hopeful — but the critics of the program were becoming increasingly loud. On the Fourth of July, I was thinking about what canned food to throw together for a late lunch when researcher Evie Weinstein, breathless with excitement, greeted me with the news: “Puffin . . . with fish!” She explained that while collecting seawater for washing dishes, a puffin emerged out of the fog and buzzed past her carrying the loveliest fish she had ever seen. The sight of the puffin with fish draped from its beak was so exciting that she nearly dropped the bucket of water. Then, at 7:40, I had my chance to see the wonder myself when the puffin returned, slicing through the fog with more fish. 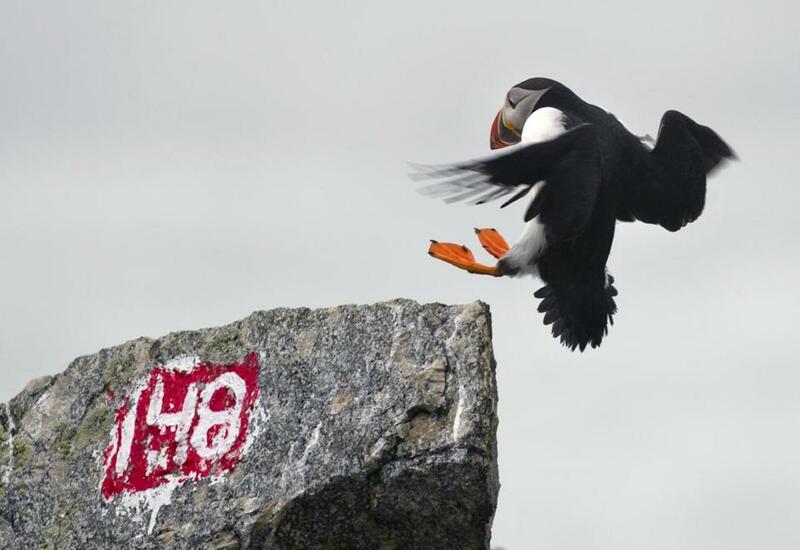 Together, we watched it deftly drop into a rock crevice and emerge without the fish — proof enough that there was a hungry chick — the first puffin nesting at Egg Rock in nearly 100 years. More than 40 years ago, Project Puffin director Stephen Kress transplanted his first puffin chicks from Newfoundland to Maine. Evie’s three words — “Puffin . . . with fish!” — were the three most important words of my career. That Atlantic puffin, with those fish, represented something that had never been accomplished before. For the first time, a seabird was restored to an island where humans had wiped it out. THE SUMMER OF 2012 saw the warmest waters ever recorded in the Gulf of Maine and has changed my thinking that all’s well along the Maine coast. Although puffins seem to have dodged climate effects until recently, other species have suggested that change has been underway for at least the past decade. At least 14 fish stocks have shifted northward in New England, and some of these have also moved into deeper water where they are out of reach of puffins. The 2013 season brought more questions. 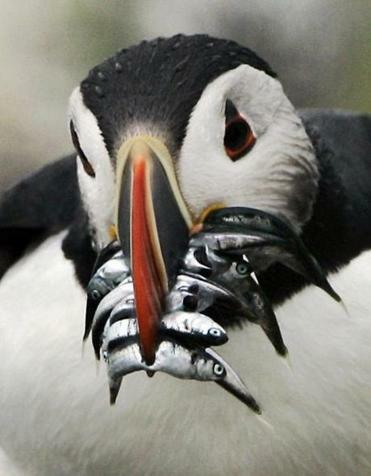 White hake and herring were not present in sufficient numbers to provide ample food for the puffin chicks. Although little is known about how far or exactly where puffins typically find food for themselves and their chicks, they apparently could not find enough near the islands and either abandoned their egg early in the season or stopped feeding chicks. This led to just 10 percent of pairs fledging chicks, and those pufflings that did fledge were of lighter weight than usual — which further reduced their chances for survival at sea. Some would take the events of summer 2012 and 2013 as certain news that Maine puffins will decline in the coming years as climate change advances. Pessimists would say that this is surely similar to what is happening to puffin populations in the eastern Atlantic, especially in the Shetland Islands of Scotland, Norway, and southern Iceland. At these once-prolific puffin colonies, warming water is linked to long strings of unproductive years for puffins. But nature is complex, and the lessons are in the details. It is too early to know whether the changes observed during the summers of 2012 and 2013 are the new normal or anomalies. But the 2014 puffin nesting season demonstrated how even small changes in sea surface temperature and the related timing and intensity of the spring plankton bloom can make or break the puffin nesting season. Following the cold winter of 2013-2014, the average Gulf of Maine surface temperature dropped by almost 2 degrees Fahrenheit from the previous year, bringing it into the high end of the “normal” range. This water temperature combined with the flow from rivers filled with freshwater from heavy, abundant winter snow to create a more typical spring plankton bloom, resulting in ample herring and white hake for puffin chicks throughout the nesting season. A surprise was a bumper crop of sand lance that further boosted the nesting success. 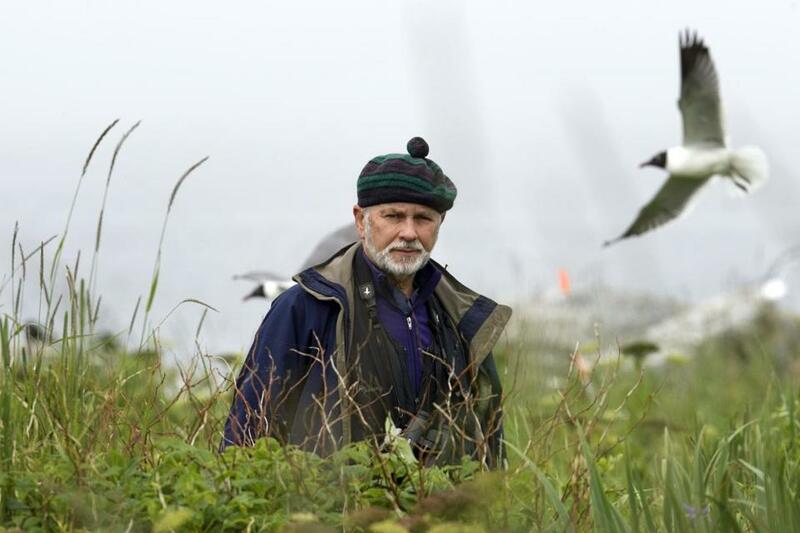 Kress used decoys to lure puffins ashore as part of their reintroduction to Eastern Egg Rock. 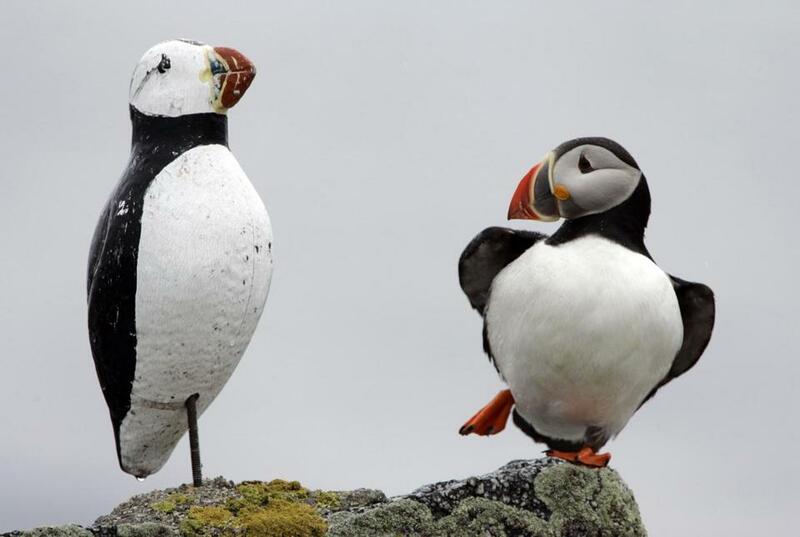 These conditions resulted in puffin production returning to the normal range at Seal Island, Maine, with 75 percent of the pairs successfully fledging chicks. For the same reasons, the Egg Rock puffin colony surged to a new record high of 148 pairs, up 33 percent from 2013. About 750 healthy puffin chicks fledged — a bumper cohort of young puffins that we hope will begin returning in 2016. Future successful nesting cycles will take a similar alignment of air temperature, snow, and currents to set the stage for the next good year. Carl Buchheister, a onetime Audubon president who gave me great inspiration early in the project, once said that bird restoration work was “on the side of life.” When questioned about what he meant, he explained that restoration was good because it helped to maintain the diversity of life on earth. Today, diversity is not a mere tally of species. It is about restoring the elasticity. Only then can we have some real hope that a threatened species will back away from the precipice of extinction. There are many bright signals that give cause for hope that an ethic for stewardship is emerging and will eventually prevail. I find it heartening that, after a hundred-year absence, puffins not only are back in Maine but have also passed the thousand-pair mark. This success, along with the proliferation of our methods worldwide, gives me confidence that humans have the capacity to expand the habitat occupied by wildlife rather than just documenting contracting ranges, loss of nesting colonies, and eventual extinctions. This is heartening support for believing that people can develop a conservation ethic for saving life on earth. Excerpted from “Project Puffin: The Improbable Quest to Bring a Beloved Seabird Back to Egg Rock” by Stephen W. Kress and Derrick Z. Jackson. Copyright © 2015. Used by permission of Yale University Press.Stephen W. Kress is the director of the Seabird Restoration Program and vice president for bird conservation at the National Audubon Society. Derrick Z. Jackson is a columnist for the Globe’s Op-Ed section. Send comments to magazine@globe.com. A puffin-viewing tour boat slowly passes Eastern Egg Rock with passengers eager to get a close-up look. Every summer, two cruise lines give 5,500 visitors the chance to see puffin colonies up close on Maine islands. Hardy Boat Cruises (207-677-2026; hardyboat.com) conducts trips every evening between mid-June and late August. 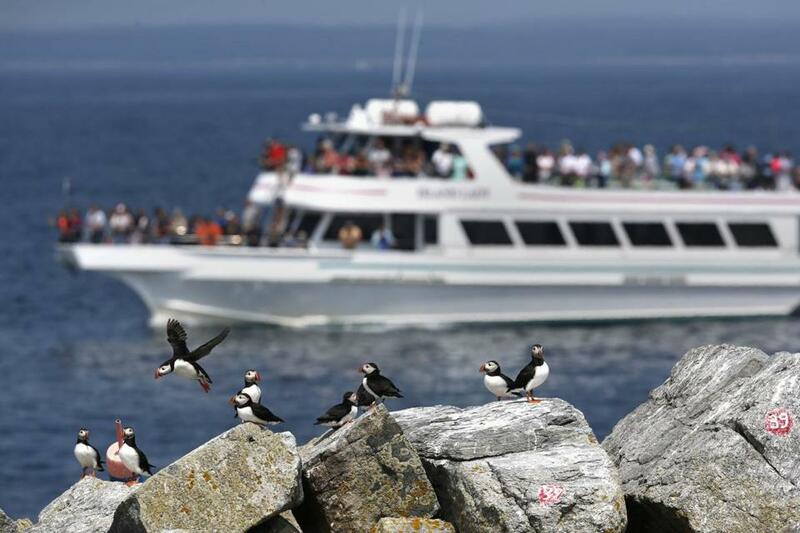 Tours depart from Shaw’s Wharf, a popular restaurant in New Harbor, Maine, and last 1½ hours, 40 minutes of which are spent circling Eastern Egg Rock to see the puffin nesting colony. Cap’n Fish’s Cruises (207-633-3244; mainepuffin.com) offers 2½-hour trips four days a week in July and August. 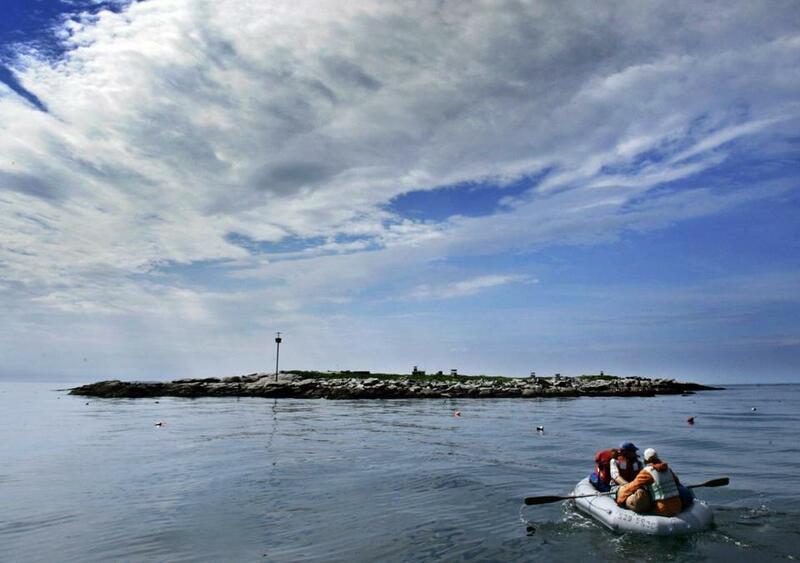 The boats depart from Maine’s Boothbay Harbor and pass several lighthouses before reaching Eastern Egg Rock. Because Eastern Egg Rock is an active breeding ground for many seabirds, neither cruise company docks there. But don’t worry — the views on deck are perfectly satisfying. Since puffins measure around 10 inches high, bringing binoculars is recommended. You might also spot a roseate tern colony that nests alongside thousands of Arctic terns and common terns. And look for seabirds like black guillemots, laughing gulls, and storm petrels, as well as harbor seals and minke whales. Both cruise lines recommend reservations.